Matt Olivers returns with another bonanza of the best moves, shakes and anticipated releases from the Hip Hop world. Bursting at the seams and chomping at the bit, Matt crams in the biggest selection yet with mix tapes, singles, albums, videos and gig news from Mobb Deep, Flying Lotus, Apollo The Great, The Mouse Outfit, Rewd Adams, Action Bronson, The Milkmakerz and many more. Amidst news of Record Store Day specials stumped up by Jurassic 5, Cypress Hill and DOOM (a pop-up book of KMD’s controversial Black Bastards), two very important issues resonated this month. Kendrick Lamar’s gregariously funky, lyrically shatterproof, conceptually aware To Pimp a Butterfly showing the Comptonite as still the man to beat; and Erick Sermon waxing lyrical about getting into the carpet industry (no metaphor) and bigging up his new Def Rugs enterprise that’s surely coming to an Argos catalogue near you. Got a blank diary? Good – go see the coup of Marley Marl taking to the decks at the Trapeze Basement on April 3rd. The Beatnuts and Jeru the Damaja seize the Jazz Cafe on April 7th, where you can also catch Your Old Droog in June, and DJ Premier and Royce da 5’9” as Phryme will be as live as it gets at Islington’s Assembly Hall on the 20th. 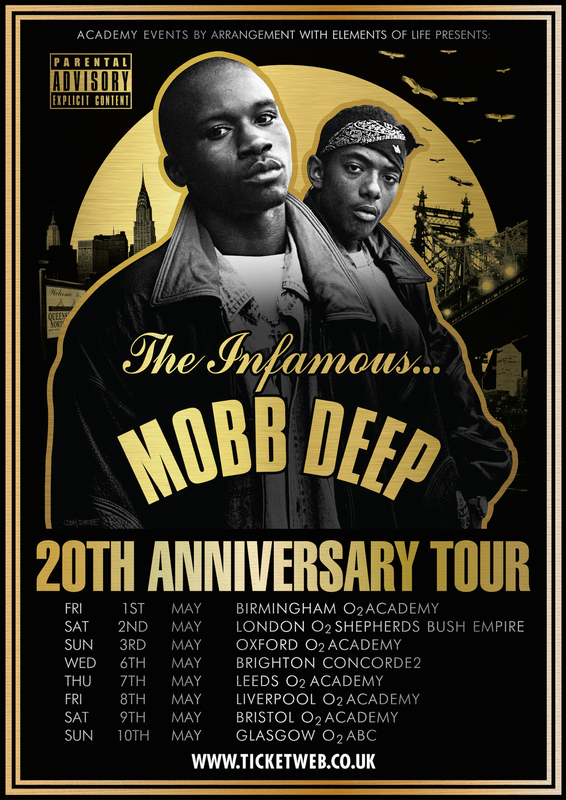 For the first fortnight in May, Mobb Deep treats the UK to a 20th Anniversary tour of the ever supreme ‘The Infamous.’ Flying Lotus and DOOM fire Brixton Academy’s Soundcrash on May 1st, and the Shabazz Palaces world tour features a precious couple of UK dates also featuring FlyLo. The Four Owls are giving a hoot at venues up and down the country until the end of June. And for all future tent pitchers, July’s Iceland ATP festival has Public Enemy and Run the Jewels at the forefront, and the Wu-Tang Clan topping the bill at July’s Nozstock. Playlist plumping this month begins with Hg’s ‘starLOG’, an instrumental drift across space terrain that becomes paranoid as the surroundings dawn on the Oakland producer. Further sobriety from TSK; ‘Bottle in the Bath’ circles the drain with isolated rhymes set to Marlon C’s piano-teetering dirge. A mixed bag from the always articulate Essa includes two live contrasts, a Tall Black Guy remix and a slightly muted banger making up ‘Evade & Seek’. Rhyming to the day’s dying embers before walking towards the flames, Lego’s ‘Jazzmatic’/’Get That’ flips between enigmatically sullen to cold and calculating in a heartbeat. Goldlink wades into BMB Spacekid’s ‘FBGM’: choppy, twangy trap with a surreal lull thrown in for good measure. The frankness of Apollo the Great on the funk-soaked ‘Frames’ tells the truth less told, and New Yorker Nutso holds a flush hand of street raids on ‘Divided Soul’, even if it’s more in regulation than his name lets on. L’Orange and Jeremiah Jae’s ‘Taken by the Night’, a tumbledown, out-of-town dawdle, sets up an LP sure to be cloaked in intriguing dust. Definitely not caring for neighbourhood strangers are Alchemist, Oh No and Earl Sweatshirt, asserting mob rule on ‘Play It Cool’ when running for leadership of GTA’s Los Santos. The rose-tinted ‘Push It Along’ is snug cipher business between Slum Village and Phife Dawg: warm fuzziness may result. The jazz-brushed, ragga-flecked Step Steadier is sound advice handed out by The Mouse Outfit; generals of the live stage, their close crew control bags an uncomplicatedly fine album both warm and crisp, with a slew of invites and extended family upholding their ethos. Once Life MC gets started he’s virtually impossible to stop; with producer Badhabitz tending to an “MPC making love to an SP1200”, Split Prophets don’t do half measures on the greatly satisfying Deep in the Trenches. Another Duracell bunny on the mic is Rewd Adams, exhibiting all of his punchy, ravenous, tale-telling qualities in noticeably compact bursts on Hunger Pains 2, taking everything from trap to mournful crackles in his stride. Jman’s generosity of wild spraying, ragga vibes and beat riding make Free Dank an offer you shouldn’t refuse. As is the promise of 1 Hour Bangers, a second electrified UK clash between Illaman and Dee Scott reporting live from a hot tin roof. Leaving the turntable tricks at home, DJ Yoda and his sensible head (well, almost), lead a newly formed, UK-spanning live outfit, with Breakfast of Champions strictly dealing in jams and performance to toast – no corn or flakiness. Classic UK crash bang wallop from Big Toast is all in the name of The Wedding Fund – Mrs Toast is a lucky lady, especially if she likes full-bellied head nodders and sweary, pint-downing rhymes. Tell your headphones how much you love them with Drew Dave’s SynthBASED, expressing an obedience of easygoing neo-soul fuzz from behind his keyboard; and The Doppelgangaz, who turn the mics off, the lights down low, and bring out the ice bucket for the open-ended tact of Rhyme Over Beats. Vursatyl strikes out on his own; with the Lifesavas emcee and Blackalicious affiliate tackling Crooked Straights. Slick, engaging, grown hip-hop and supple soul in a funky/drowsy sauce, Vurs comes from the school of faith restoration when you think the scene is sagging. Constant Deviants are still plugging way, with the laconic delivery of M.I. dragging the beats of DJ Cutt under his control; Avant Garde isn’t exactly that, but never lets slip the standards the pair have set for themselves for two decades. The pair also contributes to Sparrow the Movement’s The Jacob Theology, a crew and album fully ingrained in beats and rhymes philosophy that can’t be doing with time wasters and the faddish. Cannibal Ox’s Blade of the Ronin comes 14 years after the fabled The Cold Vein; the return of Vast Aire and Vordul Mega is full of faithful underground weaponry twisting their rap galactica street-wards. If it seems to be trudging and dragging its heels down a black hole within a firmly set template, intensity is high all the way through and the lyrical contrasts are still a unique threat. Big Shug has bluntly been calling it as he sees it for a while; Triple OGzus is the Gang Starr sparring partner gathering his thoughts and barking out orders over hard-knocking street clean-ups. Your one-man-monthly free-for-all (told you there’s always one) comes from the worldly Flip, who serves a Bavarian boom-bap buffet for the visiting AG, Phat Kat, Guilty Simpson and Killah Priest: ‘Reflection’ knows its oomph from its oompah. Rediculus is another telling a bunch of mic seekers to go nuts, casting a wide net for In Response: Dee-Fi, and coming with a consistent balance of ups and downs in pressure. 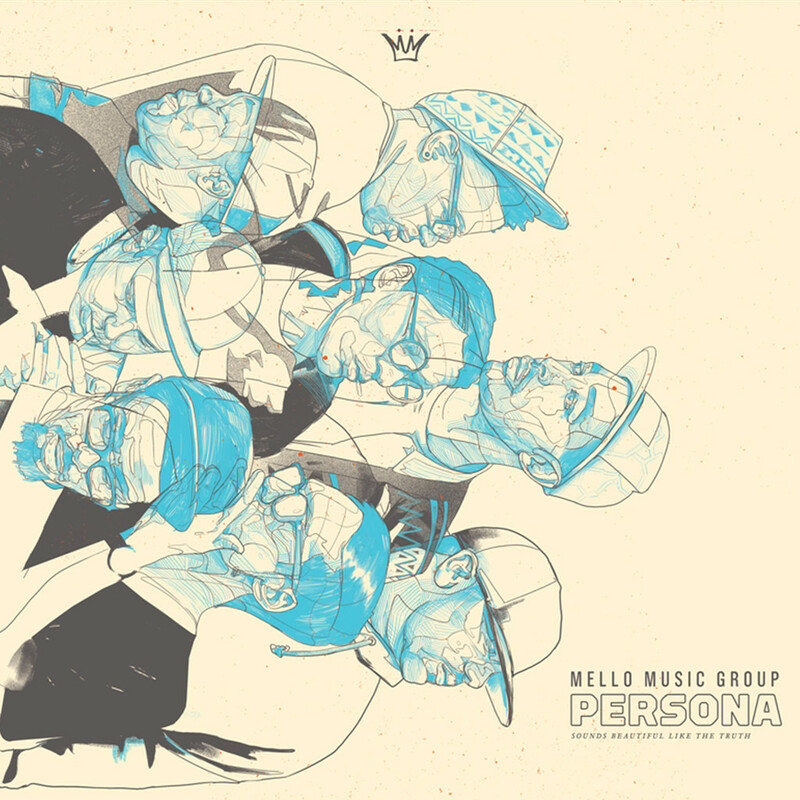 Make sure you scoop up Persona; the label compilation of Mello Music Group, whose roster clears its throat and fights the good fight for a set of hip-hop purring into the realms of the purist. You’ll be hard pressed to defeat a team calling on the hard soul and hardened souls of Oddisee, Apollo Brown, Open Mike Eagle, Quelle Chris, Gift of Gab and Masta Ace. Hood up, head down for CRASHprez’ gloomily woozy More Perfect, an intriguing, sometimes indulgent opus that knows how to keep a quick-silvered tongue in cheek when needed. The Milkmakerz’ up-and-at-‘em synth struts, soul tweaks and chest puffers are all about ‘The Anthems’ and the Fleetwood Mac-sampling swag of DJ Milktray and Jon Phonics. PS4080’s ‘Back of the Bus’ showcases “some of the greatest artists you probably don’t know about” – and as you can get 22 tracks of durable independent hustle for free, you’re happy with such a guarantee. Spring has sprung, and then darkens again within ‘Twenty(4)Seven’, due to Afromaniac’s set of tight instrumental skimmers. Claiming to have welded together 200 bruisers, Get Cryphy’s ‘Last Action Heroes’ is a megamix to get your house party started – and trashed – inside 40 minutes. Watch Doomtree’s appearance on ‘Come Dine With Me’, Clipping’s version of ‘They Live’, and Action Bronson revealing the magic of TV.